When I sat down to brainstorm how I was going to make an inspirational collage of the heart out of my med school anatomy book, I started by making a list. A list of all the words that I felt represented the *energy* of the heart. Obviously we have a heart to pump blood (and thereby deliver oxygen and nutrition) to every part of our body. It is absolutely critical to life. The heart is composed of a mass of similar cells who’s function is to work together to deliver the *energy* of blood to our entire organism. But what is the one thing your heart needs in order to do all this, in order to function at all? Flexibility. It’s strength is it’s flexibility. If your heart is boxed in, walled up, protected… it’s not flexible at all. It’s brittle. It can’t work. It will eventually self-strangulate. It absolutely *needs* to have it’s walls broken down, removed, in order to maintain it’s strength. This is exactly what happens with our heart physically. Our blood vessels become coated with plaques… but these plaques, instead of strengthening our vessels, strangulate them. The more coated, the thicker the walls, the more risk of heart attack. The heart is pure muscle… power, strength, truth and love… and it uses it’s core strength, which is the strength of flexibility, to deliver it’s heartsong… life, joy, and freedom… to the entire body. This is the power of the heart, when it is full of love, lubricated by life, flexible, bending and free. The music of life, that surrounds our hearts. It’s not gone… it’s still playing… it’s just muffled by the walls we build. If your heart is hardened, if you are protecting yourself by building walls, if you are living life defensively, how can your heart spread joy and health freely to your entire body? Your heart can not feed your body, can not feed your body joy, if it is strangled by the walls you have built. 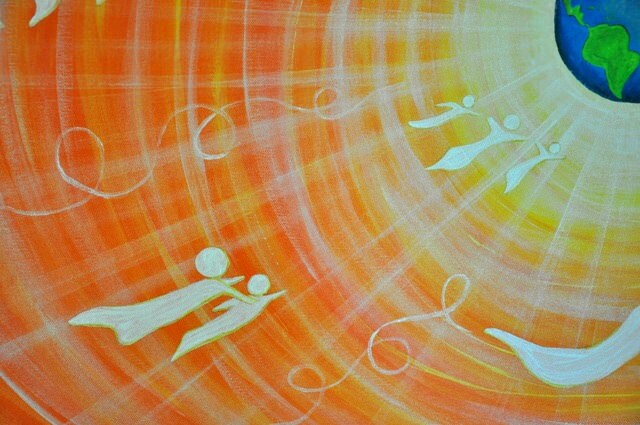 Lightness, joy, love… these are the emotional vibrations that keep your heart flexible and strong. These are the antidotes to any hardening of your heart you might be feeling. These are the ways to break down the immobile walls that we naturally build as we protect ourselves along the path of our life. Protecting ourselves comes at a price. Building walls brings a brittleness, a false strength that can suffocate that which you are trying to protect. With your own flexibility gone, you lose your power. Far more powerful is the heart that can open fully and contract fully… that can feel fully. So the first step, find what barriers you have built. Allow them to soften. Your ability to yield to life and it’s inevitable pleasures and joy will make you stronger. If your heart is feeling brittle, limited, stiff, hardened, or empty, nurture your own heart first. Begin with flexibility. Allow your thoughts to expand, give yourself the flexibility to allow multiple points of view, the vulnerability to be hurt, and the strength to bounce back even stronger. Give yourself a little love. A little softness. A little forgiveness. A little flexibility. Flexibility is what makes your heart strong. Flexibility is what feeds your entire body. Flexibility is what makes *you* strong. This piece of art is a visual interpretation of what happens to our hearts as they age. I am making my second stop in my Friday series (Favorite Thing In My Home…) in my dining room. I went in there to take a look around, stand in appreciation of what I have, and pick the one thing I treasure most about this room of my house. But first, I had to do a little straightening. Because truly, folks, there are a million and one blogs out there showing perfectly amazing women doing amazing crafts and everything always turns out perfectly. And looks beautiful. And if there is one thing I know, it’s that my blog ain’t that kind of blog. And I don’t mind clearing off a table for my blog peeps… you guys are more then worth it. That, and it was almost dinner time anyway and we wanted to actually use the table. So here is what it looks like cleared. And you can look far and wide, but you still wont see what my favorite thing is about my dining room today in this photograph. Because today, just for one day, my favorite thing about this room was all of the amazing doodles I spotted as I cleaned it up. Doesn’t everyone need a Fo Man in their dining room? Awesome use of this “To Do” pad… because becoming a comic book girl, falling in a toilet, and setting sail on a piece of poop is better then anything else I had planned today! What did my son write? Laser Hair Removal? This better be a password for Poptropica or something, and not a carefully placed hint… because I *have* been a bit lax about the shaving lately, but dang, that’s cold! See this cute little mouse, running around the plate? I don’t know about you, but he’s sold me on this recipe for sure! Seriously, there is nothing cuter then finding half backwards numbers on a sheet of paper, doodles of mice eating the food images in a magazine, or a Fo Man peering out at me. Nothing! The things these drawing do to my heart… backflips doesn’t cut it. I look at these drawing and Thank God I have children. And that I can find little gifts like these all over my house. One of the things I miss most from babyhood is nursing. And I really feel like one of the things I will miss most from childhood will be these doodles. Without them, my house will just feel so…. *clean*. Which might be great when it’s time for dinner, or when you are snapping pictures for a blog post… but not so great when the best part of your life is the little folks who share it with you. Those doodles… those are my favorite things this Friday. On Monday, I temporarily was able to satisfy my urge to blog (while my own site was down for construction) by guest blogging on the fabulous Art Snark’s blog. I wrote an article on how the world of health collides with the world of art. Please check it out! I just came across a collection of poems I had written several years ago, when my kids were babies. This poem is about those intense moments, especially in the earlier years, when you feel that you are spending everything you have, and digging very deeply to find enough energy and time, to care for your kids. I remember those times much more fondly now that they are few and far between. Actually, I miss them. But I still can have moments where I am overwhelmed at everything I need to do, and how important a job it is, being a Mommy. I was recently talking to a wonderful friend of mine (hi Barbara!!) on the phone, before I had *re-discovered* these poems. We were talking about how motherhood can literally take your breath away. Of course, 99% of the time it’s in that good way, the kind of way that makes you stand there in awe at how amazing these little beings are. But that 1%… that can be intense too… that “I-can’t-breathe-I-haven’t-even-eaten-yet-today-and-I-need-to-do-a-million-things-what-on-earth-is-it-now?!?!? !” sort of overwhelment of parenting. The impluse is to fight for my breath. I’m the sand on the edge of the beach. And I have only this one tide to enjoy. While I suffocate happily on the ocean floor. Thankfully I soaked up the high tide while I could. Pulled upon me with no resistance – no! Enjoy this slow, sweet day, my babies! And I’ve finally found my own current. The young ocean waves will dance away. 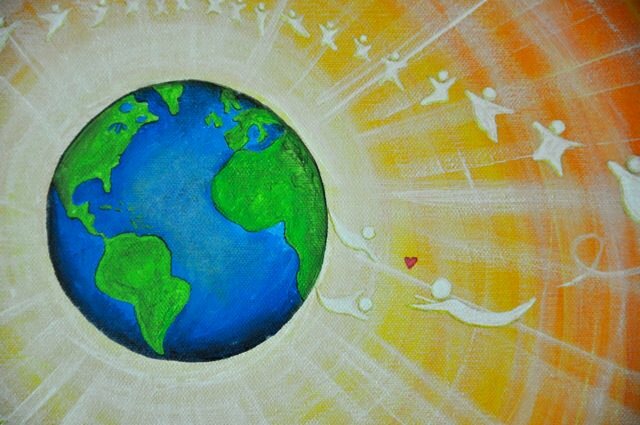 I painted this canvas for a customer who wanted something similar to my original canvas painting “Love Is Everywhere,” but larger. I asked if she had any specific requests for this newer version, but she gave me complete artistic license to follow my gut while painting it. And I’m so very glad she did. I had no idea what was to come, but I trusted and gave it a start. I love how the background took on a richer, more orange hue… and as I worked the many layers into the canvas, I noticed this orange color really allowed the universe to have more depth, as well as contrasted nicely with the blue of the earth. I was still thinking from a purely artistic vantage point, and while I was very pleased, the best was yet to come. I had no idea at this point. 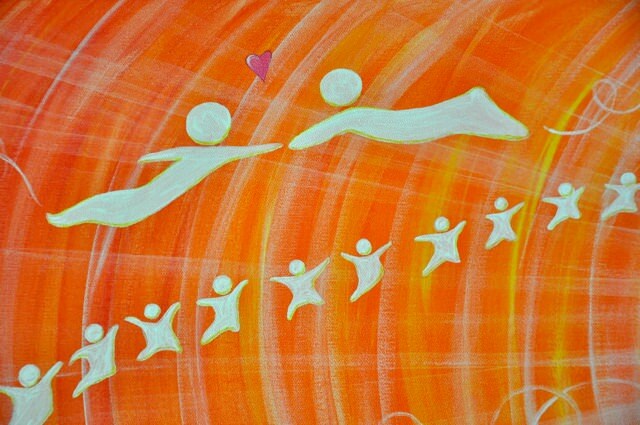 As I began to sketch the souls throughout the universe, I started by trying to echo the original placement of the souls in Love is Everywhere. I wanted to make sure that my customer got a similar painting to the one that she originally liked. At this point I was still trying to duplicate Love is Everywhere, albeit on a larger canvas, with different dimensions, and a slightly richer color palette. In between sessions, I let my imagination awake. I lay in bed one night, an insomniac through and through, and thought about the painting. What I wanted to add the next day. What I wanted to adjust. What I enjoyed about the painting so far. And then, quite insistantly, several images popped into my mind and wouldn’t leave. I stopped thinking like an artist and allowed my intuition to take over. One, in the image above, was of a child and an adult. The adult has his arm around the child, and they are eagerly and joyfully watching the earth. I had a feeling that this pair were either planning to come down to earth soon, and they were discussing the lifetime that they would get to spend together… or perhaps they were simply watching over the earth, watching a living loved one that they were connected to, enjoying watching her life from a broader perspective. The second image that popped into my mind was of this one, two young adults who are so happy to finally re-unite. I didn’t feel like I could fit them into the original design of the painting, but they just wouldn’t let me go. I saw them all the time, doodled them on scrap paper over and over, and finally had to re-arrange the painting to fit them in. I got such a relieved and tender feeling when I finally painted them. I could feel how being together and re-finding each other was the most important thing to each of them. This couple was in my original Love is Everywhere, and I just love them so much. This time a very distinct male and female energy came through, much more powerfully then in my first Love is Everywhere painting. Painting this couple was emotional for me, I felt such a strong yet gentle security emanate from the male, and such a graceful certainty and commitment from the female… I love this couple. Lastly, my favorite set of souls are the ones to the right of the earth in the picture below… the mother who is greeting her two children. I know this represents how I see myself in this afterlife. My entire being and existence seems to hinge on being Clara and Miles’ Mommy. I just feel so healed by their very presence. I feel like I came down in this lifetime first, and came specifically to be their mother. I feel complete now in a way I never did before. It is my honor to hold a space for them, to welcome them into this earth, to witness them at their most innocent and raw times, to care for them and raise them. I am equally honored to go first into death. To return to the full expansion of who-we-are. To shed my body and wait joyfully and lovingly as I watch their journey unfold. 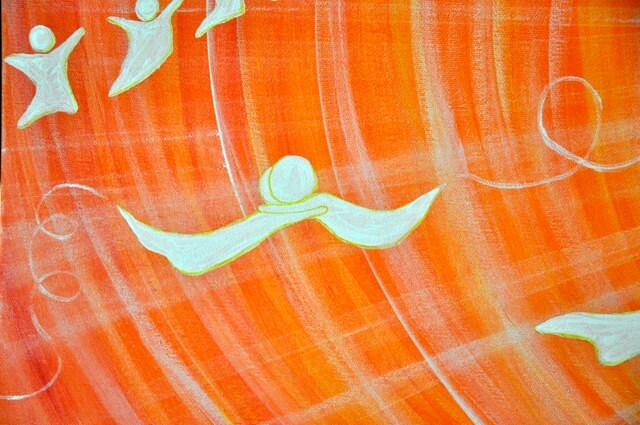 To be the first person to welcome them home when they are ready to re-join in the non-physical. Just as I was the first person to hold and love them on this earth. In some ways, it is even more of an honor. I want to be their constant. Their unwavering rock. Their home. 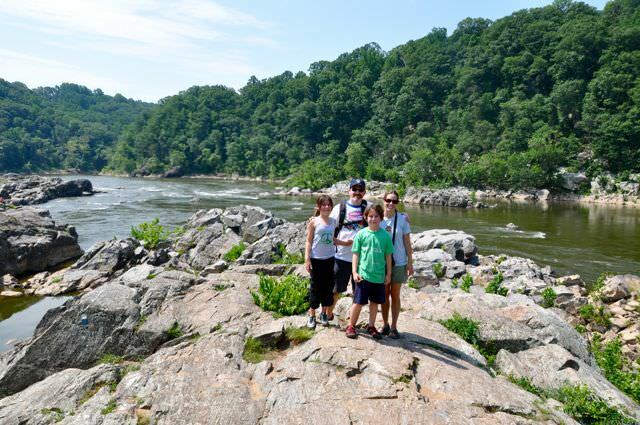 On our recent visit up *north* (meaning, Virginia) my parents took us on an awesome hike along the Potomac River, a trail called the Billy Goat Trail. 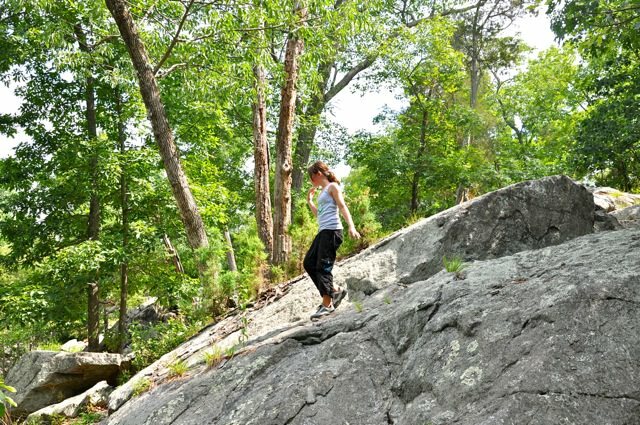 I had psyched myself up for days before this trip, knowing it would be the first time my kids would be hiking on big rocks, at relatively dangerous elevations, and I knew it would be a big lesson in trust for me. Of course the kids were amazing. 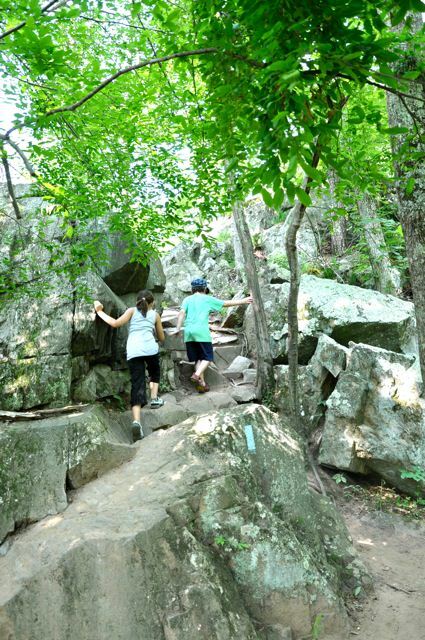 They just loved it, and they were strong hikers, climbing and exploring and using common sense, hydrating often, sensing which rocks they were comfortable climbing and how they were going to do it. 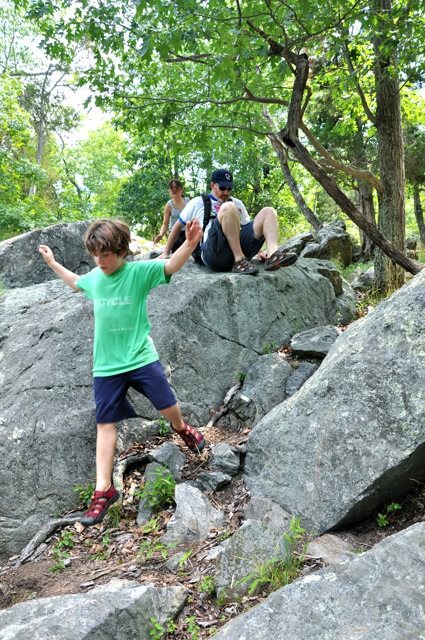 Thier Grampy taught them how to follow trail markers, and off they went, taking turns leading the rest of us through miles of woods, rocks, and riverside. That’s no surprise, really. I knew they would be amazing and take my breath away. 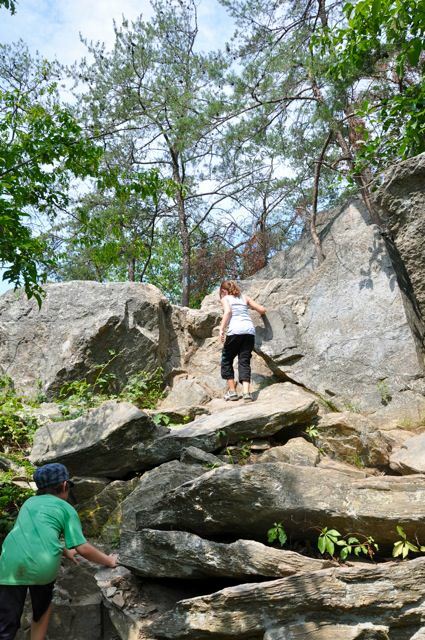 The surprise is how easy it was for me to watch them do it… take the lead, climb unfamiliar paths and steep rocky inclines and navigate narrow ledges. I really half thought I’d make us turn back before we went. 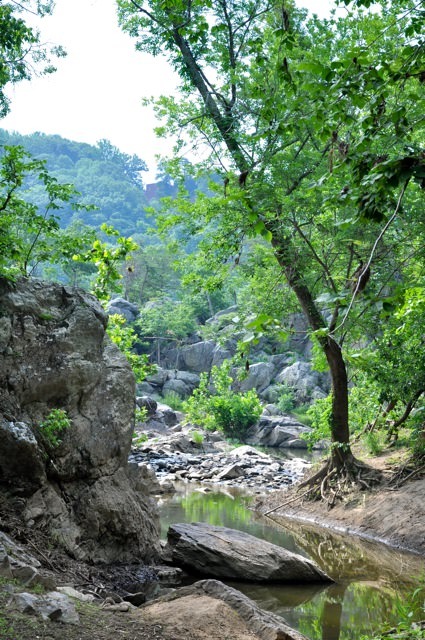 But once we were there… I felt at peace, and an enormous pride swell up, and I was just grateful to be on the trail behind them. Witnessing. Watching. There. But out of the way. I really feel like I grew a lot as a parent that day. I learned to step back a little. Worry less. Smile more at it being “their turn” and not mine. I guess that’s what parenting is all about, really. 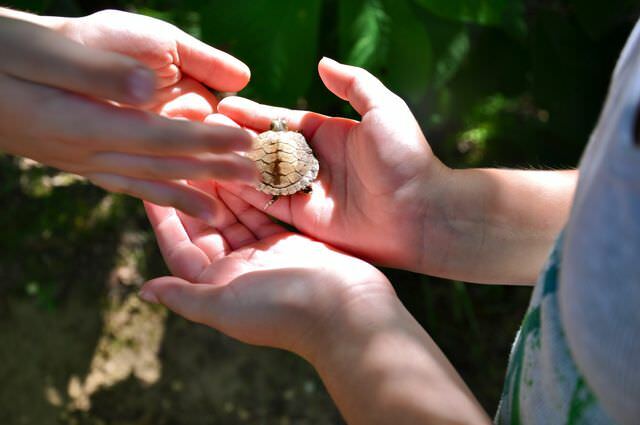 On the way up the trail, my son saw a baby turtle and moved him safely off the path, no doubt saving his life. I love Miles for noticing what I would have walked right by, and taking his own action to do what he felt was right. 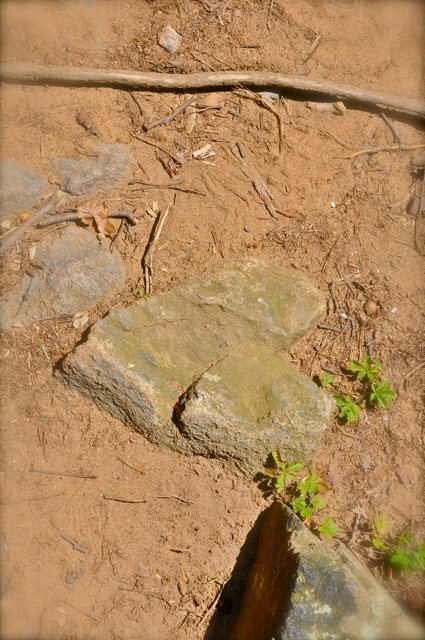 On the way back, my daughter saw a rock that made a perfect heart. Knowing that I love hearts, she pointed it out for me. I love Clara for noticing what I would have missed in nature, and pointing out to me that love is everywhere. No matter who is leading the way, and who is trailing behind. In both cases, the fact that I was walking *behind* my kids is what lead me to see their acts of kindness and to be able to share in them. Walking behind my kids, watching them shine, is ten thousand times better then me getting to walk the trail first. I don’t even want to walk it first any more. And they don’t even need me to walk it side by side any more. 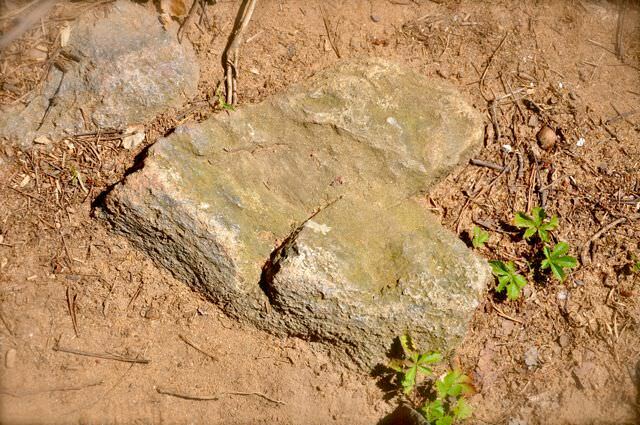 It’s time for them to walk it first, even in the rocky places. Even in the steep places. Knowing and truly trusting that they will still turn to me. Still feel that connection. Still show me the baby turtle and the heart shaped rock. 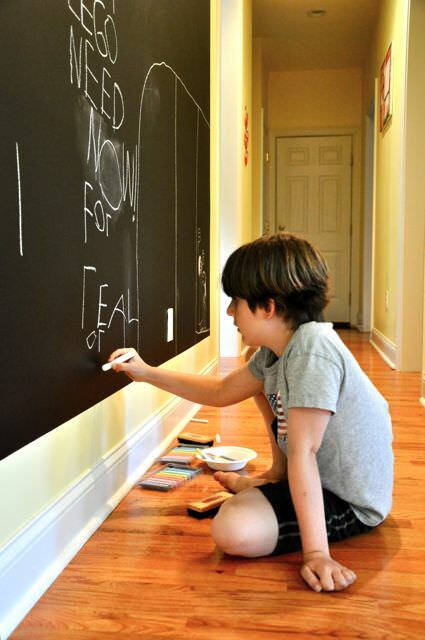 A new, huge, wall filled with chalkboard paint. I’m saying it is for the kids, but it is totally for me. I used to have about 15 different family pictures on the wall cluttering up our main hallway, and as much as I love them, they needed to find a bigger space then a narrow hallway. Time to simplify. I just finished reading Simplicity Parenting by Kim John Payne… and it really had me thinking. I don’t align with all of it, because I deeply feel that kids are a lot more able to self-regulate then he gives them credit for. Top down parenting is absolutely not for me, and he does tend to veer in that direction. But there were many many gems that even an unschooling, free learning homeschool family like mine could benefit from. One was to reduce clutter. Reduce the quantity of toys and clothes and foods that are out at any given time. Start them in rotation. I liked that idea for the toys, but I loved that idea for the food. The old fashioned “roast on Sundays, pasta on Mondays, soup and salad on Tuesdays” mentality is rockin’ it at our house. Not that we have to have the same pasta dish each Monday. Some Mondays it will be roll up lasagna, sometimes pesto noodles, sometimes chicken alfredo over linguini, etc… but always some variation of a pasta meal. 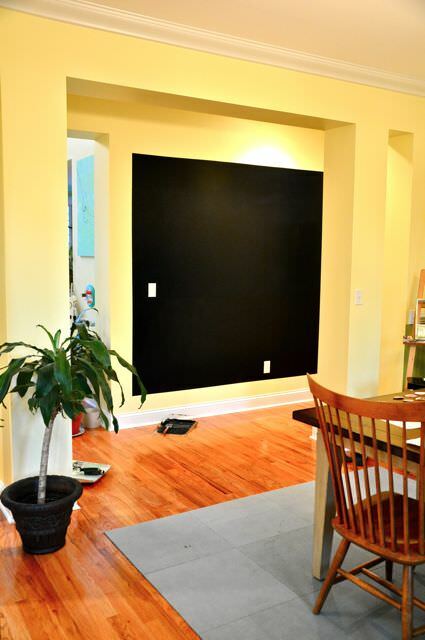 So back to the paint… mama needed a bit more open free space, and dreams of a wall with nothing but a chalkboard danced in my head. A wall I could write the day’s menu on. A wall I could write my to-do list on, and thrill as it gets checked off. 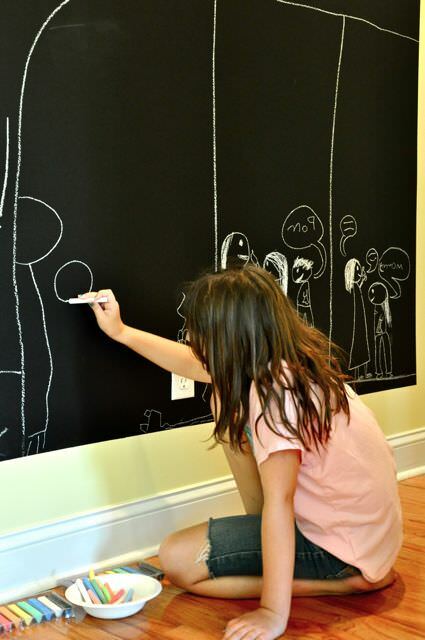 A wall that the kids could make comics on and decorate with drawings for special holidays. A wall that would be free for any form of expression. Two coats of paint later, the kids got first crack.